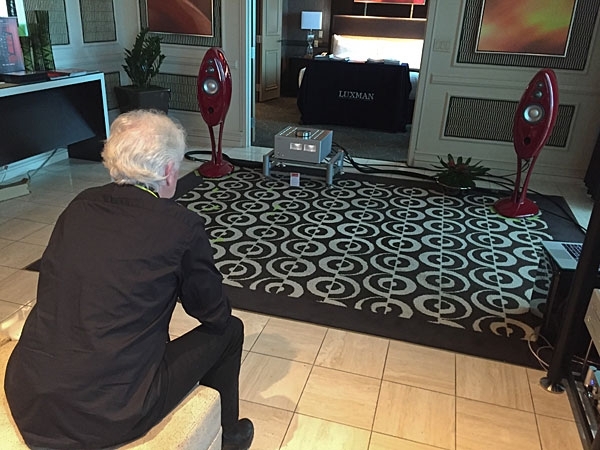 We had spent the morning and early afternoon listening to systems in the big suites, and now it was time to downscale the room size and budget just a bit. 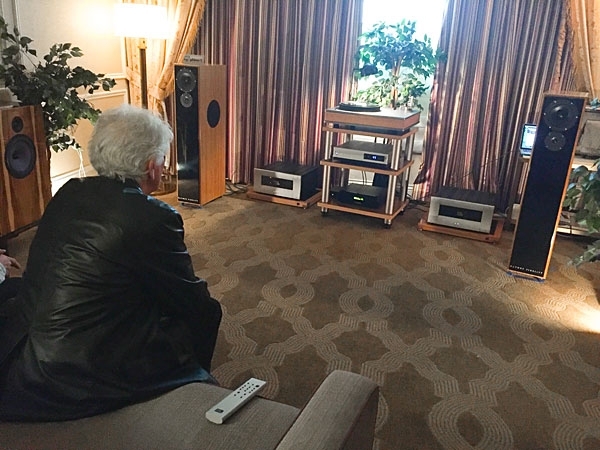 I promised Graham Nash that we would try to mix up the types of products he heard, so we headed down to Devore Fidelity on the 30th floor of the Venetian. 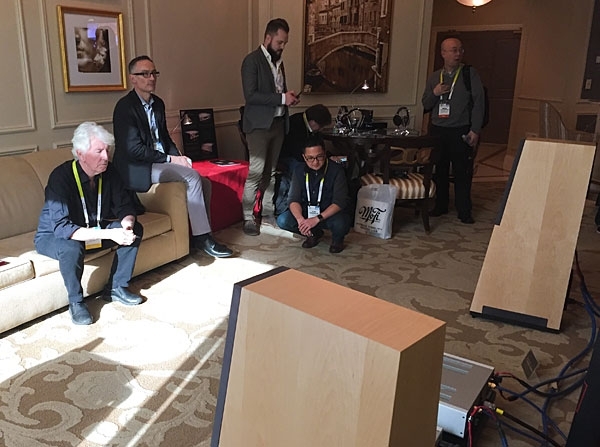 Chord Electronics had their suite divided into two rooms at CES, the main room as shown in the photo above and the smaller back room where all the headphone listening was taking place. 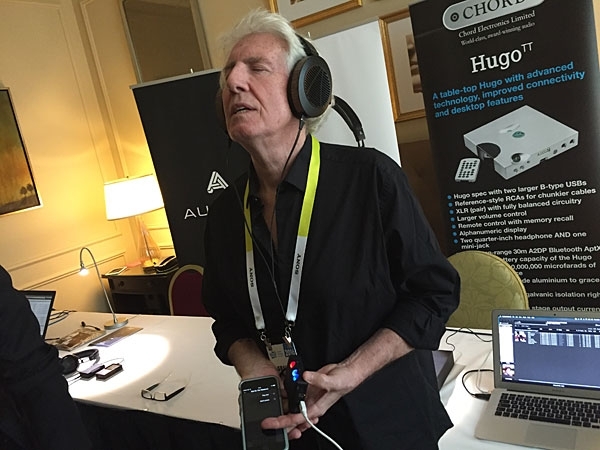 Chord had their Mojo and Hugo TT DACs set up with a variety of Audeze headphones as reported earlier. But in the main room was their latest DAVE DAC (which I'll be profiling in a later post) as well as some of their best electronics. 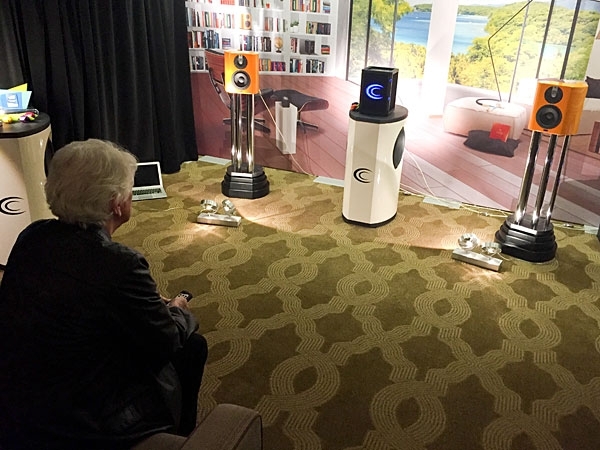 The system was topped off with one of my personal favorites, the Vienna Acoustics The Music loudspeakers. Though not a listening stop, we had to say hello to the guys from Mobile Fidelity including (L-R in the photo above) Rob Loverde, Shawn Britton and Jonathan Derda. 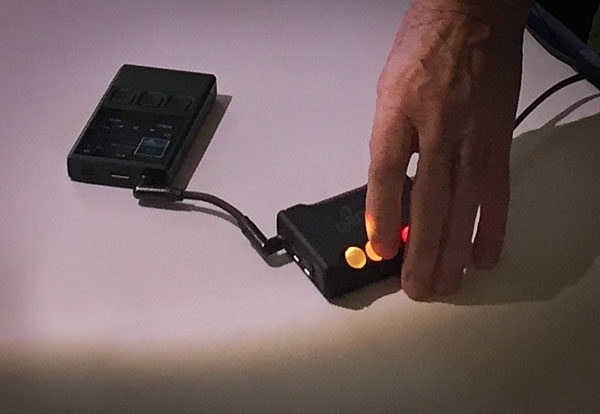 Turns out Shawn has mastered some of Graham's work, so they immediately set to talking about the new album and the possibility of MoFi getting their hands on it. 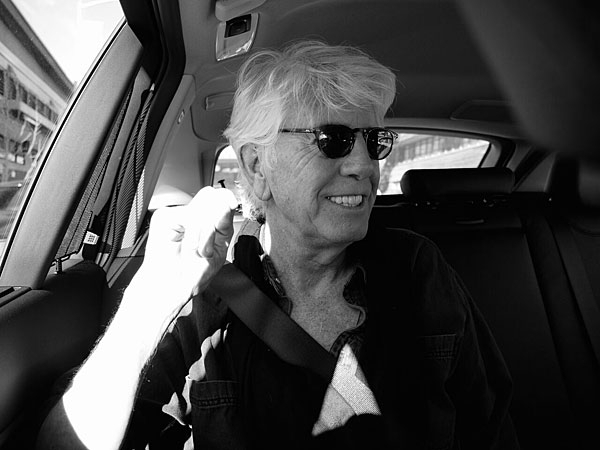 We were clearly off to a good start, so I was wondering what Graham Nash's reaction would be to an all out audiophile assault. 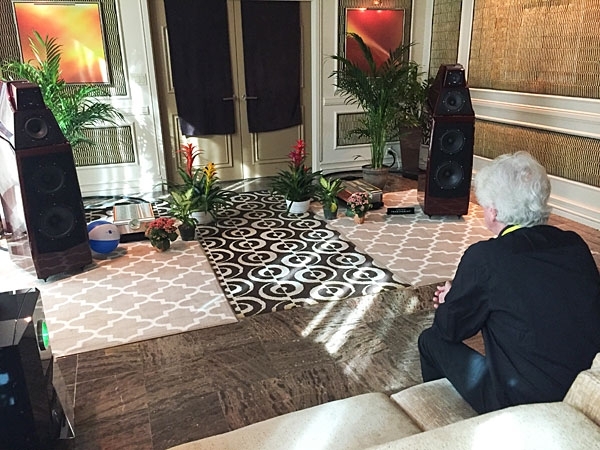 I explained to Nash that the Vivid speakers and Luxman system we just heard were relatively compact, by audiophile standards (though by no means modest), and that the next room would be more typical of the cost-no-object approach. 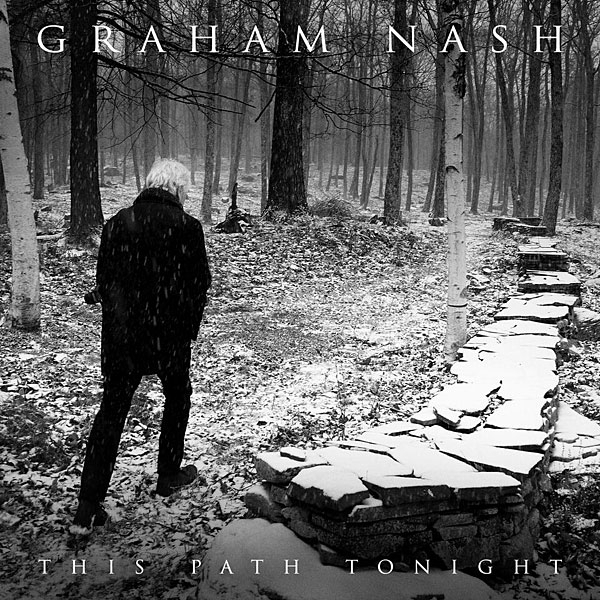 Judged by Graham's "impact of the music" criteria, would bigger necessarily be better, or might it detract from the musical intent he was looking for? 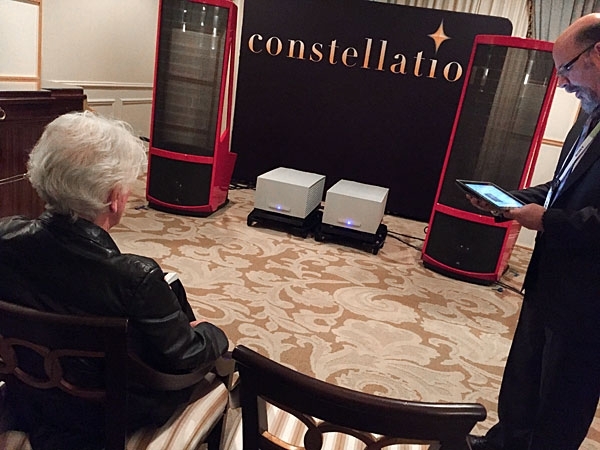 The premise is simple: how would a seasoned musician react to the sound of their new album on a variety of audiophile systems at CES? 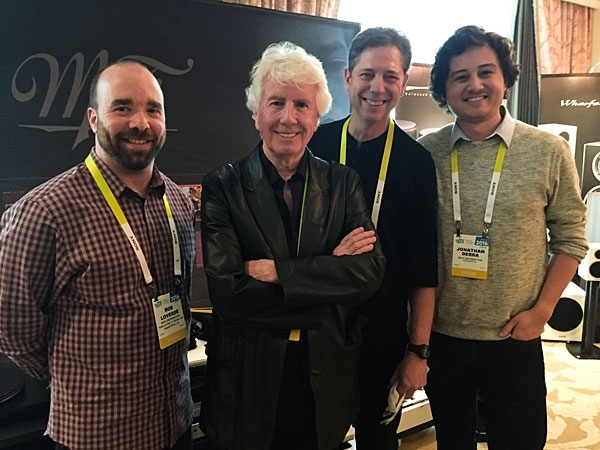 I tossed the idea to Graham Nash, and he agreed to participate in the experiment, more than a little curious about this thing called high-end audio. 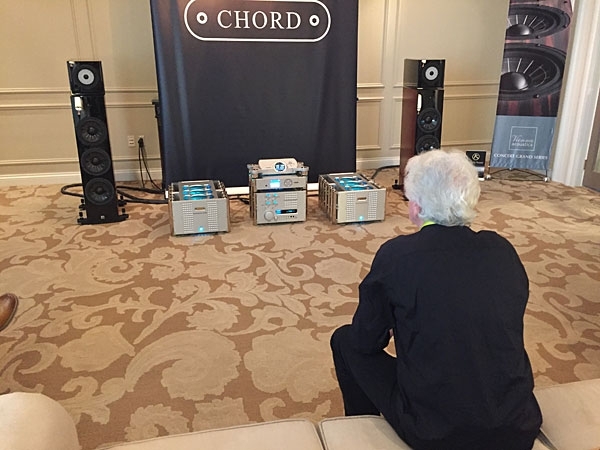 Graham is always full of energy and very articulate, so should provide some very interesting perspective for Stereophile readers.